When it comes to clocking into our jobs, our first thought typically isn’t our well-being, but rather, getting our job done. Whilst a good work hustle is important, so is maintaining a healthy regime, regardless of whether or not your job requires you to be on your feet all day or to sit in a chair for hours on end. Clocking into work does not mean you should clock out of your own well-being! A majority of people who work in offices, in particular, face the same daily dilemma – sitting at a desk for hours. In an article by Start Standing, they outline the ramifications of prolongued sitting which include; increased risk of obesity, increased risk of sciatica, back pain, the impact on the cardiovascular system, and the over all impact on lifespan. Many people resort to taking mini breaks during work hours (i.e., walking down the hall or going outside), however, for some, these breaks aren’t feasible. Coupled with prolongued periods of sitting, diet at the workplace is another factor to consider when it comes to your work-health relationship. When people think about eating at work, they tend to think the opposite – eating food from outside the office. Whilst some people bring food to the office, others rely on surrounding food establishments, which are typically fast-food joints that saturate every corner. Not only are a vast majority of quick food options unhealthy, they can be costly. Although a $10-$15 dollar meal may not seem like much at the time, the costs add up if one frequents these establishments. According to Authentik Canada, the average take-out breakfast costs $10, the average take-out lunch costs $14, and the average take-out dinner costs $20. A majority of people only purchase 1-2 meals, on average a day, but even so, the costs are staggering. If you were to just purchase lunch every work day (approx. 20 days a month) at the average price, you are spending just shy of $300 a month on one meal alone! Lisa Fulford-Roy of CBRE knows all too well the importance of creating a healthy workplace that will not only benefit the body, but the wallet as well! What are the initiatives you implemented to become a Well Certified Company? All employees have sit-stand desks to reduce sedentary behaviour and alleviate back/shoulder pain. The internal air quality is in the Top 1% in North America, and far better than the majority of homes. Sensors detect when CO2 levels rise to pump in fresh air from outside (not recycled air) to keep employees alert and fresh. No more yawning through long meetings in stuffy rooms! The lighting system automatically adjusts to the level of natural light outside. This is designed to minimize employee’s exposure to electric lighting, which is proven to upset your natural circadian rhythm and sleeping patterns. In order to improve acoustic comfort, noise cancelling diodes emit white noise to cut down on background noise – which has been cited as one of the key causes of stress and distraction among office worker. Even the ceiling tiles help improve sound attenuation. Which of Well Concepts / Features had the biggest impact on employee productivity? Employees first seem to notice the sit-stand desks as the biggest positive change as it physically changes the way they work, which is great as so many desk workers suffer back pain. However, over time people come to appreciate the things they can’t see, fresh air and good lighting, which they credit for feeling better, getting sick less often and increasing their overall energy level. How long did it take to get the changes in place? 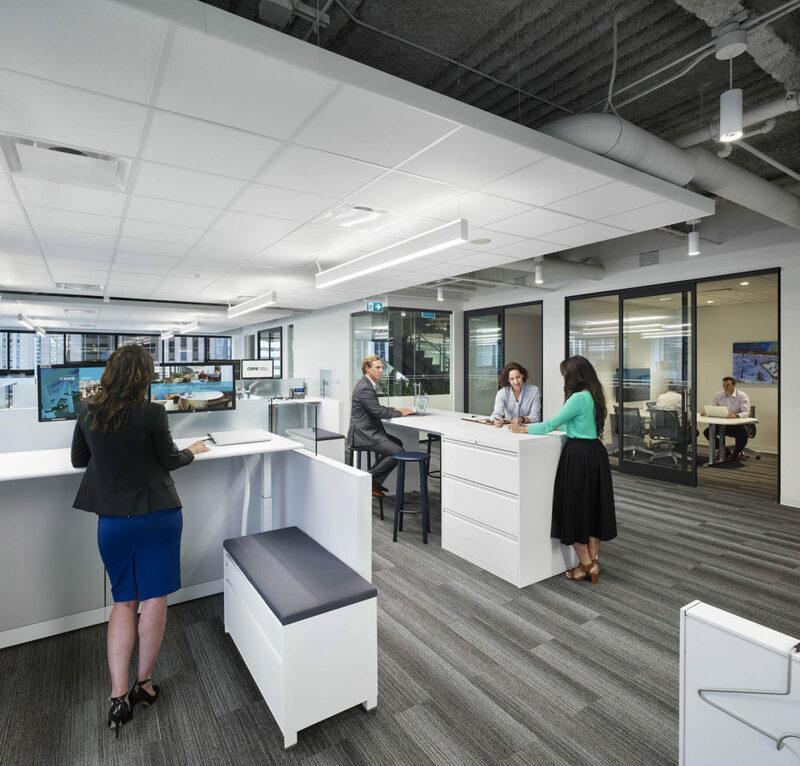 We had the benefit of planning for WELL Certification as part of our overall office transformations. The entire transformation process, from planning to construction and opening, can vary depend on the size of the project. Has employee retention improved since you became a Well Certified Company? and have you noticed a significant improvement in productivity? For most companies, their biggest expense is headcount, which is typically 60-70% of total overhead. Real Estate tends to account for only 10% of costs, but small investments here can have a huge impact on employee retention and recruitment. Since 2015, in offices that have undergone our workplace transformation, our employee turnover rate fell by almost a third. We have also doubled our hiring rate of new talent. Do you think the Well Certified Concept will start to filter down to smaller companies and home based businesses? For us the additional investment was a no-brainer and we expect that the war for talent will encourage all employers to engage in practices like WELL that help attract, retain and motivate employees. In addition, we expect that these investments will ultimately have a positive impact on our bottom line through increased productivity, better client outcomes and reduced employee absenteeism, which appeals to companies of every size. What advice would you give to companies wanting to become Well Certified? For most companies, real estate tends to account for only 10% of costs, but small investments here can have a huge impact on employee retention and recruitment. Another important point to note is every office requirement is different and if you’re building to WELL standards you have to take into consideration the condition of the base building. If it’s a Triple Class A LEED platinum building it will be more streamlined than a Class B building.